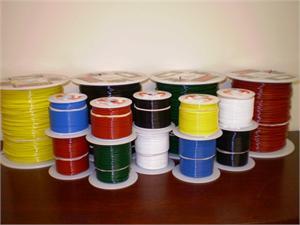 This wire is ideally suited for lighting equipment, motor and coil leads, transformers, control panels, military equipment, industrial controls, computers, and appliance wiring applications. This wire meets UL Style 10368. Description: Single conductor stranded tinned copper insulated with .010” XLPE insulation. This construction allows for a uniform, flexible, concentric, quality construction. Standard Put-Ups: 100 feet, 500 feet, 1,000 feet. 2,000 feet online minimum. Please call or click on "Contact Us" above to inquire about stock availability of smaller quantities.